When in Monza Lewis Hamilton claimed yet another dominating victory while his closest championship rival suffered a retirement, it looked like the 2015 Formula 1 title might have already been decided. And then, out of the blue – like the sport we used to know – the state of play took an unexpected turn to deliver a completely new result… in the magic that is called the Singapore night race. Scratching of heads and rubbing of eyes started as early as Friday that weekend, when it wasn’t the two Mercedes topping the time sheets – and last year title winners seemed to understand as little from what was going on as the onlookers. This continued until Saturday afternoon when, for the first time in 24 races, the Silver Arrows were beaten in outright speed battle for pole position – and not just by one driver, but two complete outfits. Perhaps less surprisingly, it was their closest rival in the standings – Ferrari – who took the front spots on the first and second rows, heading two Red Bulls and leaving only the third row for the Mercs. This reshuffle of the grid left everyone – the championship leaders including – rather edgy on race day; although pole sitter Sebastian Vettel could not hide his joy for securing the strategic spot, even (or especially) if it meant robbing defending champion Hamilton of the chance to match his hero’s Ayrton Senna’s record of eight consecutive pole positions. 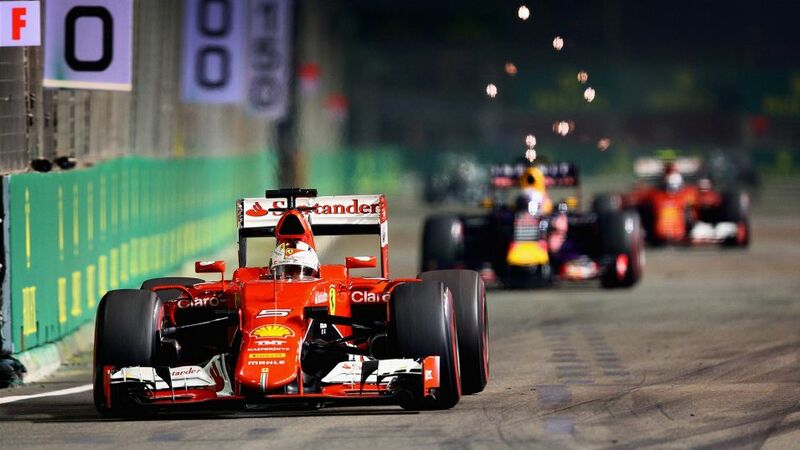 Singapore saw a dominating performance by Vettel and Ferrari that took everyone by surprise. 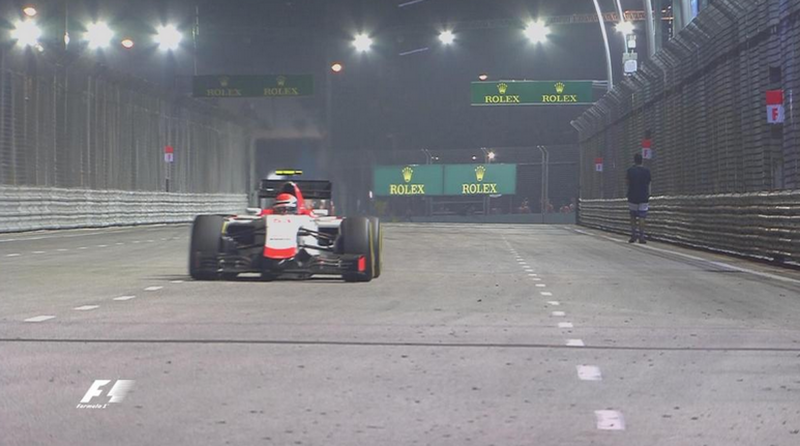 But once the lights went off in the heat of the Singaporean Sunday night, the race did not get to a dramatic start, except for the stalled Toro Rosso of Max Verstappen that had to be pushed back to the pit lane from where it managed to rejoin the game. While Vettel shot out into the lead, chased by Daniel Ricciardo’s Red Bull, neither Hamilton nor his team-mate Nico Rosberg were able to edge ahead of their starting positions and even had to defend from Williams attacking from behind. This steady setup continued until the first lot of pitstops on laps 12/13, which is when Williams’ position was shaken as Nico Hulkenberg drove his Force India into Felipe Massa, who had just emerged from the pits; the Brazilian had to make another stop on the following lap, while the Force India ended its afternoon in the barriers, with a three-place grid penalty for the next race. 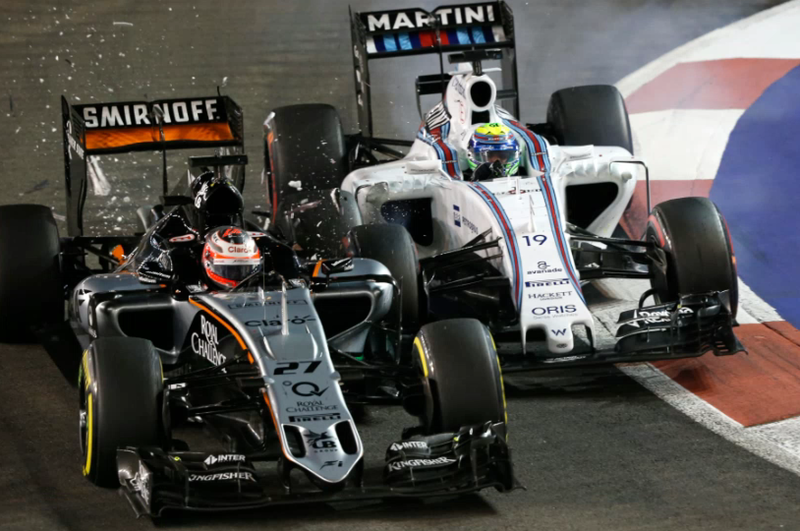 Force India only managed to get one car across the line, following Hulkenberg’s early collision with Massa. A safety car period to clear up debris from the track reset the advantage the leading Ferrari and Red Bull had developed over the second Prancing Horse of Kimi Raikkonen and the rest of the field, but once the race restarted the frontmen were back at it, racing each other for the win. 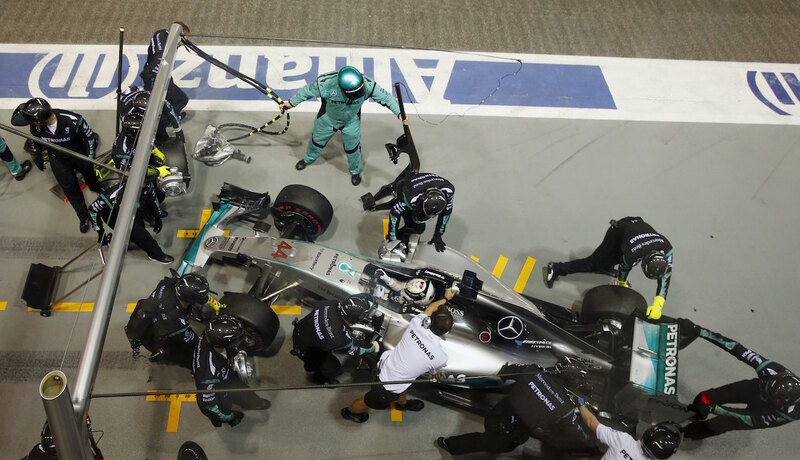 The Mercedes hadn’t progressed in that time, until lap 27 when Hamilton reported loss of power; the decrease in performance was evident as the Brit begun to drop down the grid to eventually mark his first DNF (did not finish) of the 2015 season. This had certainly made the news at the Marina Bay – but drama-seeking crowds had even more joy coming their way when a fan made his way onto the track for a leisure walk alongside the speeding cars. The incident brought out the second safety car and the lot got bunched up together again. Annoyingly for Raikkonen, the Manor of Alexander Rossi – undertaking his first ever Formula 1 race – got stuck on its +1 lap, separating the Finn from Vettel and Ricciardo up front; even worse was that the Manor’s team radio wasn’t working, so the rookie never got the message that he was allowed to unlap himself before the safety car came back in for the race restart. That made Raikkonen’s attempt of snatching the second podium spot finish from Ricciardo an even harder feat. Earlier that afternoon, his team-mate was looking to control the speed of the race in such a way that would allow the Finn to get closer to Ricciardo and eventually overtake him; but the looming threat from the Aussie, who somehow could generate more speed than his team-mate Daniil Kvyat further down the grid, eventually deemed Vettel’s helping efforts pointless; and in the closing stages of the race it became evident Raikkonen lacked the speed of the two runners in front. The thrill-seeker who disrupted the race is facing up to six months in jail and a cash fine. 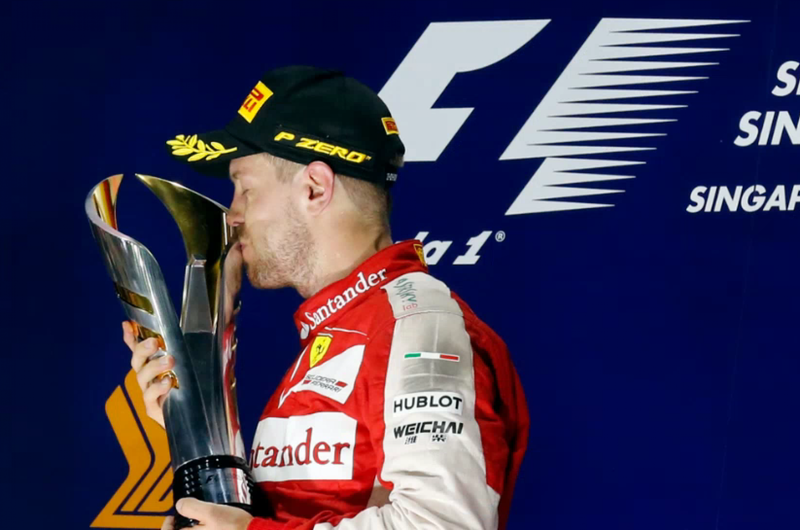 In the end, the three of them finished as they started – to the roaring cheers of the Singapore party crowd, and a general appreciation from the F1 world. This result has bumped Raikkonen ahead of two Williams in the championship standings, and Ricciardo ahead of his team-mate Kvyat; but maybe more importantly, Vettel’s third win of the season has narrowed his gap to title challenger Rosberg to only 8 points. “Ever since we put the car on track on Friday morning, we were on the back foot and it only improved a little today,” said the team’s director, Toto Wolff, on Sunday night. Marina Bay saw both: the first pole in 24 races handed to a non-Mercedes driver and Hamilton’s first retirement of the season. There were other worrying news coming from Singapore for some teams; firstly, in the form of the two McLaren Hondas both retiring from a race that was meant to be favourable to their car – and the situation is not looking likely to improve any time soon, with rumours circulating of the 2009 champion Jenson Button considering closing his Formula 1 career at the end of this season. Button is expected to announce his F1 career plans at the Japanese GP. “I should have known, really, that he’s mental,” Button said on the team radio about the Venezuelan, who has, however, retained his contract with the Enstone outfit for another year, despite his crash tendencies. While Romain Grosjean lost out on the last point-scoring spot when his used tyres could not keep up the challenge against two Toro Rosso. 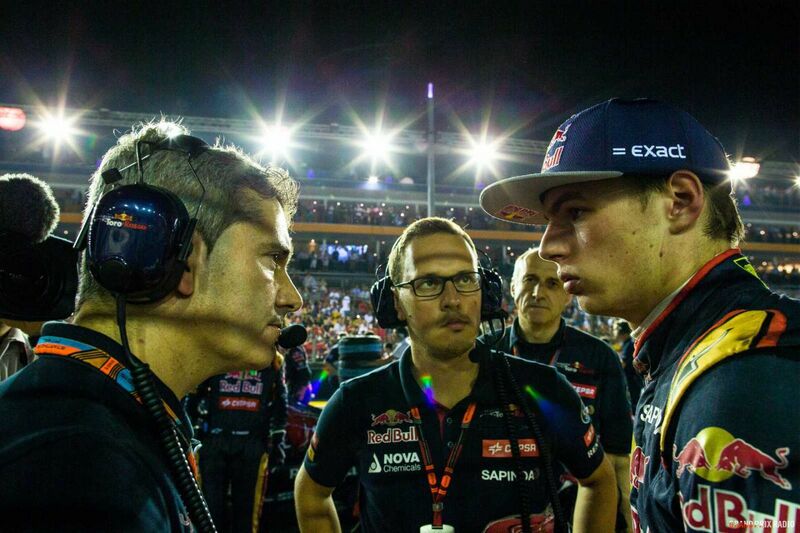 The junior Red Bull team had a moment of controversy of their own at the Bay, when 17 year old Max Verstappen refused to heed to team orders to hand over his grid position to his team-mate Carlos Sainz, who believed himself better capable to challenge Force India’s Sergio Perez for 7. position. Defiant Verstappen has proved his determination to keep on climbing the F1 ladder. “First of all, if you’re one lap down and you manage to be back in the points as the leading Toro Rosso, then for me there is no reason to switch positions,” Verstappen defended his decision after the race. With Vettel’s win in Singapore, the German has beaten an Ayrton Senna record of his own – the 42 race victories make one more than the legendary Brazilian’s tally. “It was an incredible race today, in fact all in all an incredible weekend and it is difficult for me now to sum it up,” Vettel said after the race. “Today we are in paradise, but we know we’re still a long way to go. Many had dubbed the weekend a journey back in time to Vettel’s champion days at Red Bull; many more are harnessing the hope that this was not just a one-night wonder, but an actual change of play on the F1 scene. Now it is down to Suzuka to shine a light on the question: is the Mercedes-era finally over?